at the bases of hills. Once we found these pieces we would generally find more pieces higher up the hill above where we found the first. As we moved up the hillside the pieces we would find appeared less and less weathered until we wouldn't see any pieces at all. 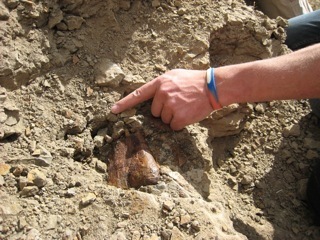 When we stopped finding bone we would brush away at the hillside where the last piece was found and sometimes find the source of where the bone fragments were coming from, usually from a bigger piece of bone still partly covered by earth. Float Mapping usually refers to finding loose rock below its source, but we were able to apply the same principal in finding where loose bone fragments came from. This same process is how many of the dinosaur bones are found in the Grand Staircase.